Join us for a conversation with author, Guy Belleranti, who has written hundreds of articles, stories, and puzzles for Super Teacher Worksheets. An avid reader and writer, a volunteer educator at his local zoo, and an animal enthusiast, Guy Belleranti shares his views on popular books kids are reading these days, holding onto childhood dreams, and what it takes to become a great writer. How old were you when you first became interested in creative writing? What inspired you to begin writing? I began writing when I was in elementary school. As a kid I always liked making and creating things, so one day I began my own little newspaper to give to family and friends. However, the newspaper issues didn't contain any news. Instead, I filled the pages with comics, jokes, and some animal and dinosaur facts. I had a comic strip going for a while about a spikey-haired kid. One summer I also made a book, filling a loose-leaf binder with around 90 pages of prehistoric animal illustrations and facts. I've always loved reading, and I believe you have to be a reader to be a writer. My mother was also a reader; when I was in my teens, she began writing and selling articles to newspapers and magazines. I thought that was cool. However, it was many years later before I actually wrote anything for publication. My first sale was a humorous filler (a short piece of writing) to Arizona Highways. The drawing on the left was created by Guy Belleranti when he was in third grade. The article on the right was written by Guy for Super Teacher Worksheets. What kinds of writing do you enjoy? I enjoy writing for both children and adults. I write fiction, nonfiction, poetry, puzzles, and jokes and riddles for children. Super Teacher Worksheets features hundreds of nonfiction articles about animals that you've written. How do you choose what animals to write about? Many of the animals I've written about are ones we have at the Reid Park Zoo where I am a docent (volunteer educator). 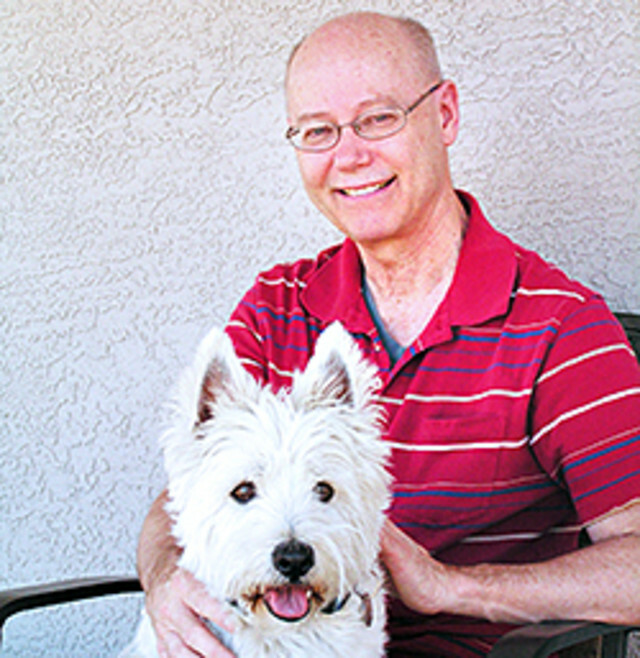 I also write about other animals and nature-related topics that intrigue me. I have a degree in conservation, and my strong foundation in the natural sciences and biology provides me with expertise in this area. In which publications has your writing been featured? My writing for children has appeared in Highlights for Children, Jack and Jill, Humpty Dumpty, Boys' Quest, Hopscotch for Girls, Fun for Kids, Pockets, Kid's Imagination Train, The L.A. Times' Kid's Reading Room, Spaceports & Spidersilk, and Knowonder to name just a few. Additionally, I've sold two level readers to Reading Reading Books. The first was published in August 2014, and the other is scheduled for publication this coming fall. How did you become involved in volunteering as a docent for your local zoo? I saw an announcement that the zoo had an upcoming class for docent training and decided to check it out. How does working at the local zoo impact your writing? I'm continually learning from others - especially the zoo keepers and zoo education staff. I include some of what I learn in my articles. The zoo is very active in conservation efforts around the world, and I try to include a conservation message in many of my articles. What is your favorite animal at the zoo to educate children about? Has this animal been an inspiration for any of your writing pieces? I would probably say the small handling animals I often demonstrate are among my favorites. I enjoy the looks in children's eyes when they have the opportunity to touch a non-venomous snake, a hedgehog, or another small animal. And yes, I've written articles about hedgehogs and several types of snakes. Do you ever experience "writer's block," the common obstacle of many authors who can't think of an idea for their next story? How do you overcome writer's block? One reason I write many different things is to make sure I am never "blocked." If I'm working on a piece and it isn't flowing, I often set it aside until another day and work on something else. I do try to do something writing-related almost every day. To have any success at writing one can't just sit and wait for inspiration. I suggest keeping your eyes and ears open for ideas and writing them down before you forget them. I sometimes wake up in the middle of the night with the glimmer of an idea. It's not always easy, but I try to get up and write it down. If I don't, the idea is often gone by morning. What would you say to children about the dreams they have for when they grow up? I would tell children that they should never give up on their dreams for when they grow up. Dreams make life fun and give us something to aim for. 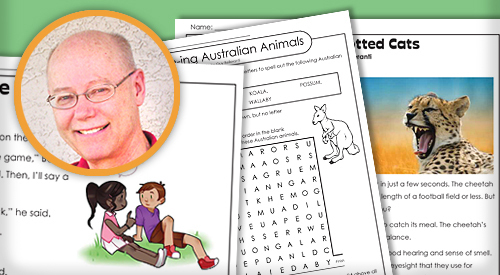 You have created a large number of animal puzzles for Super Teacher Worksheets. What is involved in creating a puzzle? From the time I was a kid I have always loved reading and solving mysteries. And puzzles are a type of mystery - something that has to be solved. There are all kinds of puzzles - mazes, crosswords, secret codes, brain teasers, etc. I enjoy playing with words and ideas, and that's what I do when I create puzzles. I also like to put an educational payoff in the puzzle when possible, proving that learning can be fun. I usually first do the puzzle on paper and then later convert it to a computer file. If you could give advice to an aspiring author, what would you tell him or her about becoming a successful writer? First, READ. When you read, you unconsciously learn grammar, punctuation, spelling, sentence structure, etc. There are many writing books out there, but I don't think you can become a successful writer by just reading how-to books. Reading articles and books about different aspects of writing definitely can be helpful, but you have to read all kinds of things, especially the types of things you might want to write. And then, you have to plant yourself in a chair and do it - write! That can be very hard at times - you're staring at a blank page or blank computer screen, and that's intimidating. But just get something down. Open the faucet and let the words and thoughts flow. Don't edit yourself at this stage, just write something. You can edit and revise later. In fact, revision and rewriting are vital to creating any good piece of writing. Another thing I would tell an aspiring writer is that to sell your writing you have to know the markets - each magazine, newspaper, and publishing house has its own specific style and needs. If you want to be published there, you have to take the time to read and study that publication. Your love of animals from a young age is evident in the wide variety of pets you had growing up. Describe a couple of the animals you kept as pets over the years. As an adult I've had dogs (I love dogs! ), a cat, and, for a time, tropical fish. When I was a kid I also had turtles, a salamander and a newt, an assortment of bugs and several toads. The toads lived in my yard. I would keep one for a pet for a few days and then release it back into the wild. I'd take my toad out bug hunting at night. I would shine a flashlight to attract bugs, and then watch the toad catch the bugs with its fast tongue. The strangest pets I ever had were some weird looking "fish" from a friend's rock pond. I brought them home and within a few days they began changing. They turned out to be mosquito larvae! You also work in a school library when you are not writing or volunteering at the local zoo. What do you notice kids reading these days? What kinds of books are popular with elementary students? Younger children, such as preschoolers through 1st grade, enjoy reading funny picture books (so do I!) and books about princesses, animals, dinosaurs, trains, and monster trucks. Graphic novels and comic books such as Amulet, Bone, Baby Mouse, and those by Raina Telgemeier (Drama, Smile, Sisters) are really popular with those a few years older. Super heroes are big, especially with boys. Popular chapter book series include Diary of a Wimpy Kid, Magic Tree House, Infinity Ring, and Dork Diaries. Some of the older elementary kids and middle schoolers like the Percy Jackson books, as well as other books that have been made into recent movies such as The Hunger Games and Divergent series. Do your students know you're an author? Are you a celebrity at your school? Yes, some know I'm an author, but, no, I'm not a celebrity. I'm just a regular guy. I did read my leveled reader to a couple young-aged classes earlier in the school year. And a number of teachers have used my Super Teacher Worksheet pieces in their classes over the years. I've also received letters through my website from teachers in other states and as far away as France and New Guinea, saying how they've used my writing in their classrooms. In addition, animal articles, poetry and short stories of mine published in Kid's Imagination Train have been illustrated by talented students at both my present and previous school. That's been fun since both the children artists and I are published together! Check out the February, March, April and May issues of the magazine for examples. 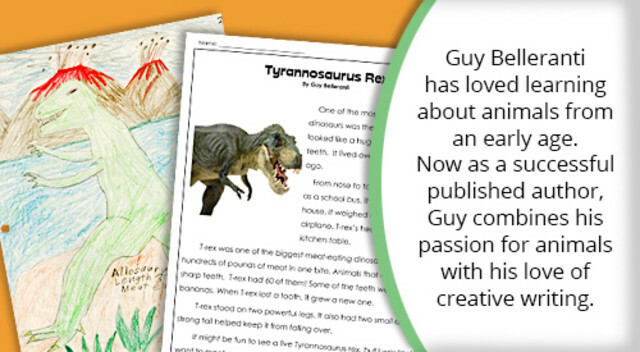 Be sure to check out Guy Belleranti's animal articles, fiction stories, poems, and puzzles on Super Teacher Worksheets! Have you used any of Guy's work in your classroom? Tell us in the comments below!